I know we all love fried egg rolls – who doesn’t? What you may not realize is you can enjoy virtually the same flavors without the gluten filled fried egg roll wrap, and the task of rolling, filling and frying them! I remade the paleo egg roll in a bowl I posted a couple weeks ago basically because it’s AMAZING and so incredibly easy, changing it up a little to make it spicy (and it was spicy)! I can’t seem to get enough of the Asian flavors lately, such great combinations by switching out or adding just a couple ingredients. Saute the coleslaw mix and minced garlic in the coconut oil for about 5 minutes until the coleslaw starts to cook down, add the grated carrot and jalapeno. Continue sauteing until vegetables become soft and pour the coconut aminos and sesame oil on the mixture. Toss to coat and saute 10 minutes more so the vegetables absorb the liquid flavor and start to “fry” in the pan. Portion desired amount into a bowl and top with green onion, cilantro and shredded unsweetened coconut. Side note: I didn’t measure the cilantro, green onion or coconut. I love cilantro so I was fairly generous with it and as a result it had a great flavor, same with the onion. The coconut added a nice sweet crunchy flavor, although I used it more sparingly. On Saturday’s Seth and I tend to cook even more than we do during the week because we have more time to prep, and aren’t as rushed. The weather has been gorgeous in San Diego, especially in the evenings, so we’ve been grilling a lot. 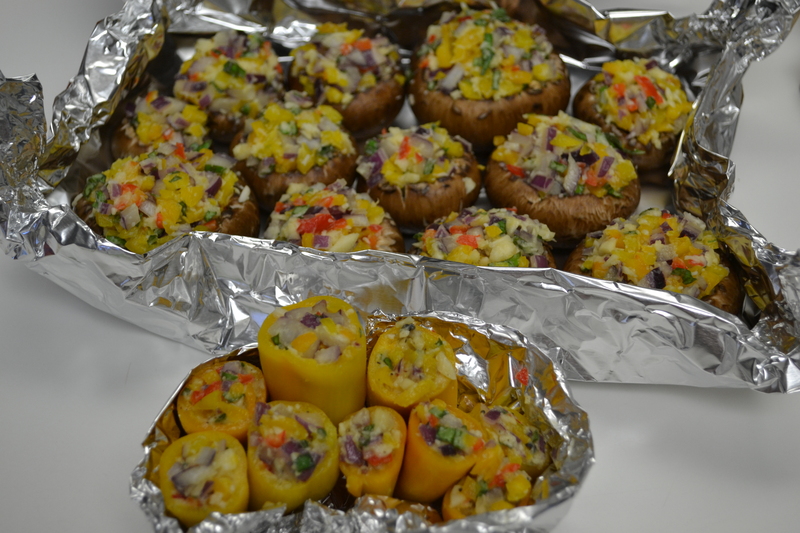 This past Saturday, we had a little veggie grilling party: Seth’s Stuffed Shrooms (http://wp.me/p2zSoO-1S), stuffed peppers and grilled zucchini. 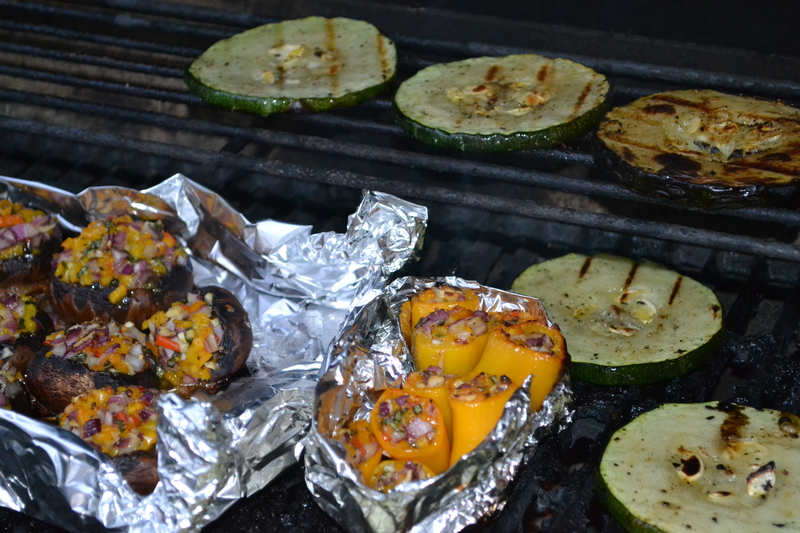 We also grilled some zucchini we were given from a friends parents (yay for sharing fresh food!). 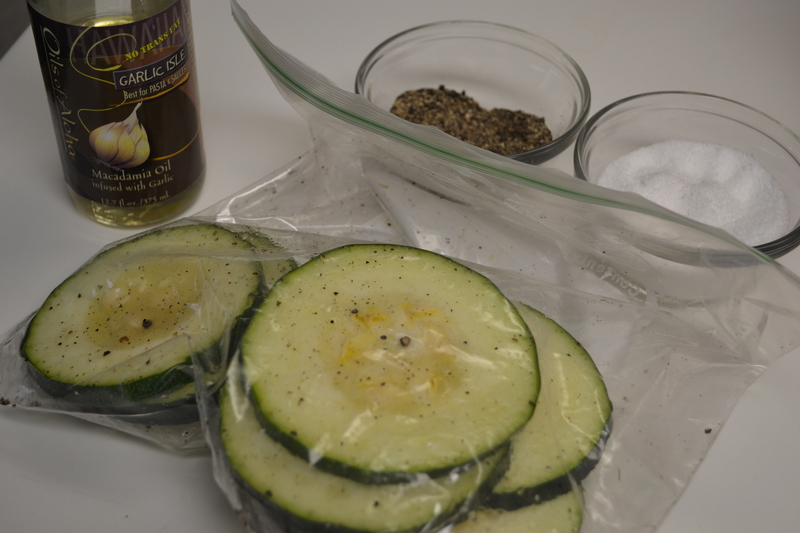 These zucchini are gorgeous, huge, and so easy to prepare. Simply slice them thin, toss the slices in a large zip-loc bag, sprinkle kosher salt and black pepper, and a drizzle of garlic macadamia oil and then shake in the bag. Zucchini is my favorite grilled, because it has so much water content, it crisps better, in my opinion. I use macadamia oil to cook with as it’s more heat tolerant and the properties don’t change increasing toxins, like heating olive oil. This is a Paleo aspect.